Those long showers you enjoy so much could be hurting your house. All that humidity and moisture in a concentrated space, your bathroom, creates the perfect breeding ground for mold and mildew, which can damage building materials, including drywall and wood framing. You want to be sure you have the right equipment to preserve you new residential renovation. Fortunately, you have a friend and defender, the bathroom exhaust ventilation fan. Consider room size, vent method and bonus features when picking a system for your bathroom remodel columbus ohio. This little workhorse removes excess moisture, odors and even mold spores that can lead to health problems. In some areas, exhaust fans are required by building codes, especially if there’s no operable window. NJW, your custom home remodeling contractors, can help you pick out the right fan for your newly remodeled space. Small and unobtrusive, bathroom ventilation fans have benefitted from new technologies that make them smarter, quieter and more efficient than ever. Today’s features include motion-activated lights or heat-exchanger ventilation. Home improvement companies should assist you in choosing a ventilation fan; make sure it’s one that will be adequate for the size of your bathroom. You’ll also want to prioritize your wants and needs with regard to noise level and features so that you’ll get maximum satisfaction for your budget. Choosing the right fan keeps your bathroom dry and comfortable. Bathroom ventilation fans have different air flow capacities, measured in cubic feet per minute (cfm). To get the right fan for your bathroom, use the guidelines set by the Home Ventilating Institute: Your fan should have 1 cfm for every square foot of floor space in your bathroom. But don’t worry if this sounds like a foreign language to you, our properly trained experts will be there to assist you in your decision. We like to make sure our clients feel confident in the choices they make and part of that is lending our expertise to assist you in that process. 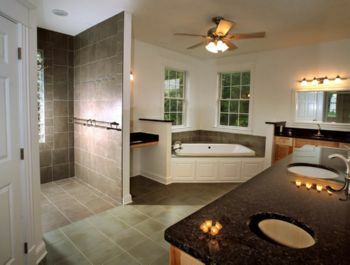 Let NJW, your bathroom and kitchen remodeling experts, put your mind at ease. Our years of experience will benefit your newly remodeled space. Feel free to check out our online bathroom photo gallery and get inspired! We currently build in, Whitehall, Upper Arlington, Powell, New Albany, Pickerington, Lancaster, Bexley, Gahanna, Westerville, Worthington,Dublin, Hilliard, Columbus and all of Central Ohio. Contact us today!